AND HOW CAN IT HELP YOUR SCHOOL? UMS is developed to help the school’s IT-department avoid trivial and hour-long administration tasks. However, teachers and students will also benefit from it with an intuitive web interface and app. Want to know how? Read more below. With UMS, manual user creation is a thing of the past. Based on data from the student administration system, UMS automatically creates and maintains users in Active Directory, G Suite, Office 365, and learning management systems. UMS also gives the school’s students and staff access to a self-service portal, where they for instance can reset their own password, thus saving time for the IT-department. Many teachers find themselves with a multitude of administrative tasks they need do to, in addition to their other tasks. This could ultimately affect the amount of time they have for teaching. 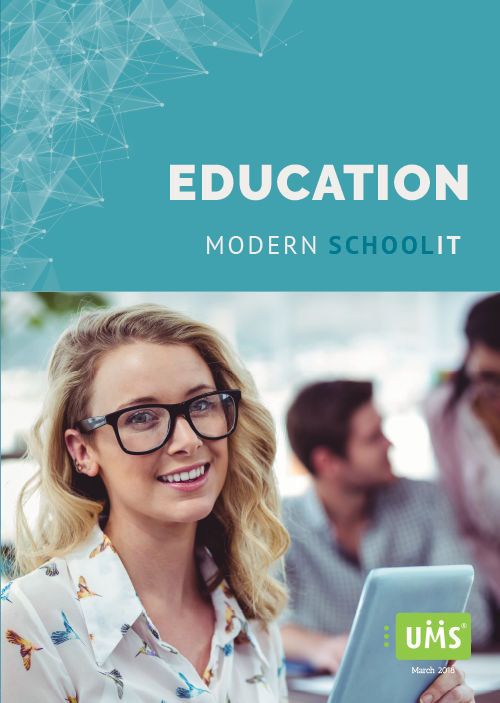 With the UMS self-service portal, app, and SMS modules, teachers can quickly and easily complete the administrative tasks. In other words, UMS gives teachers more time to teach. As there is a long list of relevant school information easily accessible, it is easy to be a student with UMS. Students can e.g. see their timetable, homework, grades, and attendance records via web and SMS. They can even get notifications on their phone if there are changes to their timetable or other important information. This makes it easy to stay up-to-date and it strengthens the students’ affiliation to the school. 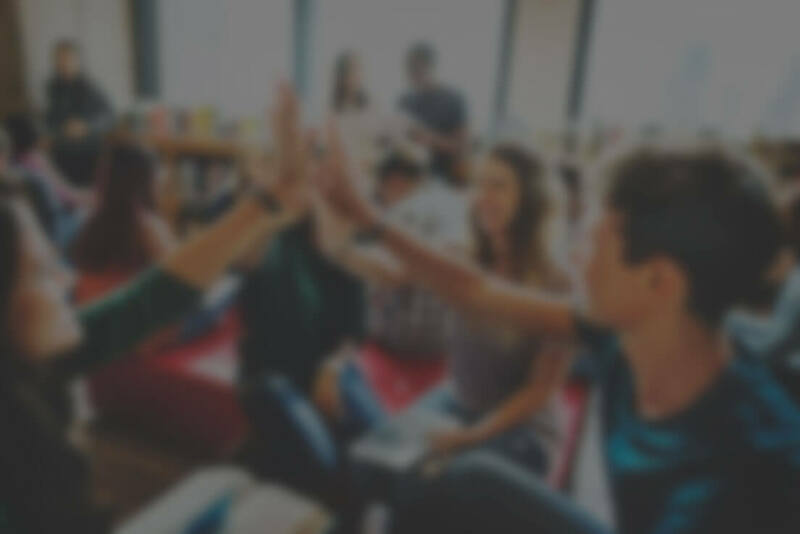 Based on data from the student administration system, UMS automatically creates, maintains, and deletes users in Active Directory, Office 365, G Suite, and many other systems. 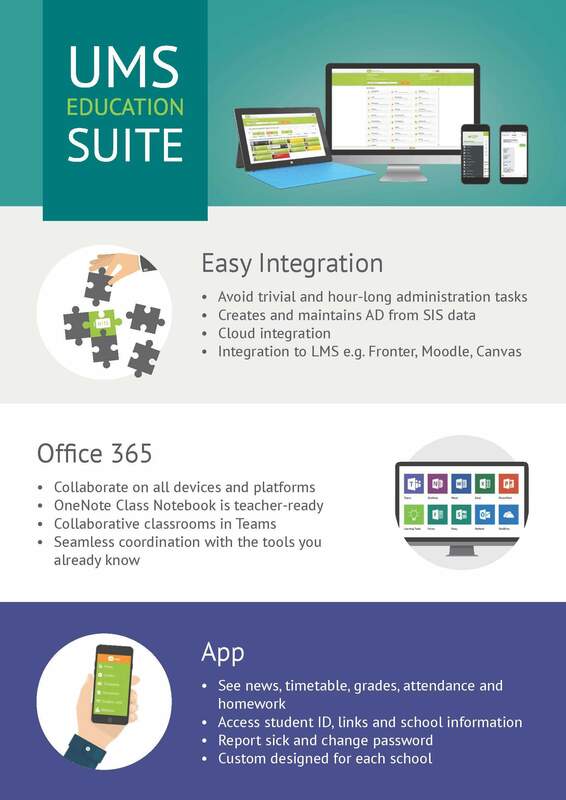 UMS integrates with Office 365, SharePoint, G Suite, Google Sites and Drives. 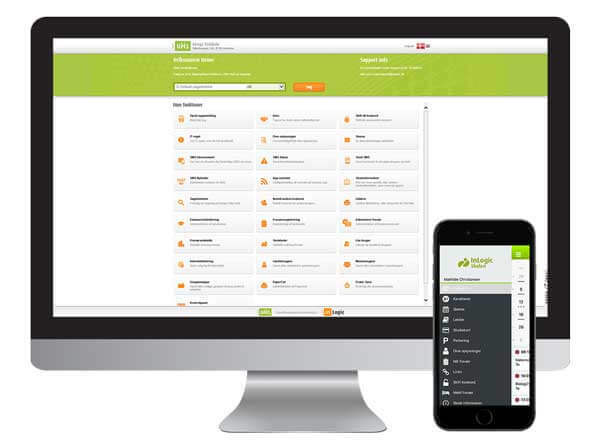 Timetable data automatically synchronizes to Outlook and Google Calendar. We have also developed a learning portal to Office 365 SharePoint. UMS automatically creates class and group rooms in Canvas, Fronter, Moodle, SharePoint, etc. Additionally, we integrate to a long list of other systems, e.g. library systems, print payment systems, and cafeteria systems. UMS gives you a single login portal where users can register attendance, reset passwords, block internet access, create guest users, send SMS, see attendance records, and much more. 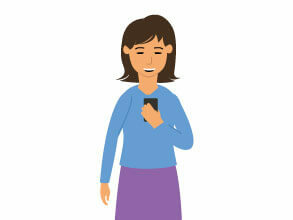 The best way to reach your students is through their phones. With UMS, the students can automatically receive an SMS when there are changes to their timetable. They can also reset their own password, receive their timetable and grades, and much more by SMS. With UMS, your school can get its own smartphone app that is designed with the school’s colours and logo. The app gives students access to their timetable, homework, student ID, attendance records, news from the school, etc. Want a UMS School App for your school? Did you know that you can get a customised UMS School App designed with the school’s colours and logo? The app gives you the possibility to communicate with your students on their preferred communications platform. This way, important messages are read faster and more easily. The app can be used by your teachers too, e.g. to register attendance. UMS School App is available for iPhone, Android, and Windows Phone. Want to learn more about UMS? Take a few minutes to watch our videos and learn more about what UMS is and what it can do. Watch this video for an introduction to what UMS is and how it can benefit your school. Watch this video and find out how UMS can help you maximize the full potential of Office 365. Watch this video and learn more about the app features and why our app is the ideal communication solution. Watch this video for an introduction to our attendance modules and how it can benefit your school. If you want to know more about UMS and all the possibilities you get, please visit our product portfolio or read our brochure. We are always looking for partners all over the world. 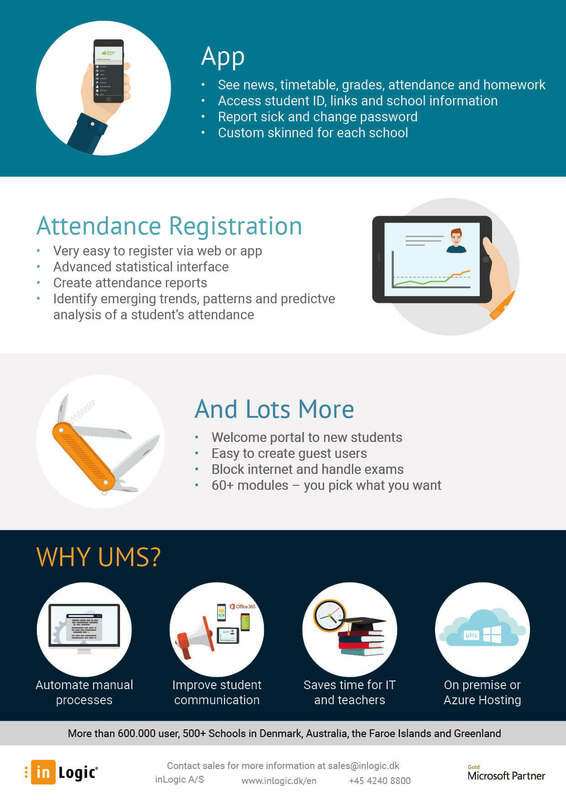 In this brief summary of UMS, you get a quick overview of some of the features and benefits of UMS Education Suite. 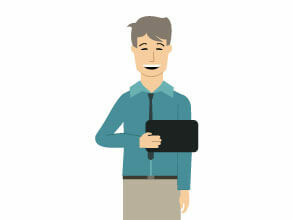 As an inLogic partner, you will be able to provide your customers with industry leading education tools. You will earn on license sale and have free access to consulting hours, Azure Hosting, and much more. For more information about how to become a partner, please contact sales@inlogic.dk.